The LEDM08 LED Shallow Large Walk-Over & Drive-Over Ground Lights from KnightsBridge are ideal for use as guide lights for driveways, garden paths, paving slabs, and are suitable for use in bathrooms and other wet rooms. These energy efficient 1.2W LED lamps are an unobstrusive solution with an extra shallow fit making them suitable for wall use; and robust polycarbonate construction, providing you with a high output glow and a reliable lighting solution. 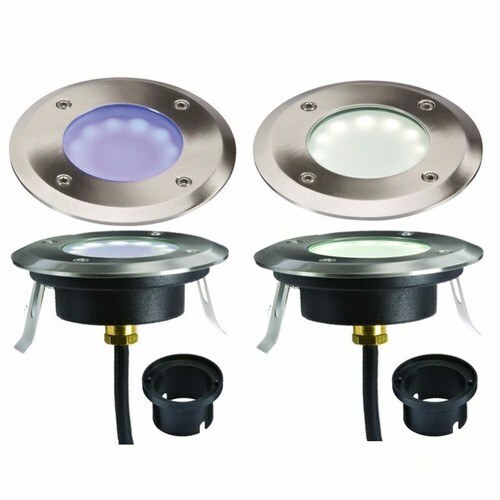 Available in blue and white options, these lamps are fitted with a robust stainless steel bezel, require no additional drivers and trasformers and can be wired directly to 230V mains electricity, singularily or as a series, requiring only additional Cable and the appropriate Junction Box. Suitable for decking and stonework as well as interior floors and walls supplied with optional thermoplastic sleeve for in ground applications duch as in Concrete or Paving Slabs, extremely shallow and making it extremely versatile. Suitable for Drive Over (max 5mph 800kg) when used in conjunction with Sleeve in Tarmac or Concrete.